Discussion in 'Pricescope Testimonials' started by Rob_001, Aug 14, 2016. (I think he's being doing this for a long time) and he really delivered on his word. The whole process went extremely smooth with no hiccups whatsoever. He provided a list of diamonds that fit my budget and criteria and once we narrowed it down he made the call to ensure everything about the diamond was as it was advertised and most importantly that it was eye clean. He had the diamond shipped to Victor at Rose jewellery in downtown Toronto (his setting guy) who did a fantastic job at a great price point, who was also great to deal with. Overall the process from when i picked up the phone to when i had the finished ring in hand took about a month. The end result was a beautiful engagement ring that my wife to be to say the least was extremely happy and surprised( we've been together for 10 years, i dont think she was expecting one at this point). I cant say enough good things about Martin, his pricing and quality could not be beat, he was knowledgeable, professional, and most of all his customer service was top notch. I felt throughout the whole process I was in good hands and any questions and doubts I had were addressed promptly. So if you're in the search for a diamond I'd highly recommend giving Martin at usa certed diamonds a call, you will not be disappointed. Thanks for reading. Had a great experience with Martin. I know I got the best deal, (10% lower than James Allen), and by far the best value stone compared to many many others we viewed with other vendors and even through Martin's search. I hope you are both doing well. I just wanted to thank you both for your help in buying/creating an engagement ring. First of all Jessica loves it, and her mom loves/is jealous of it (she was a top saleswoman at a retail jewelry store for years). All of Jessica's friends that see it can't believe it. It really is beautiful and often we think, does it show TOO WELL? We both agree that this ring is something for the future. She wears it with pride knowing that our business is doing well, we are doing well, and eventually the ring will suit us just fine... the ring is that amazing that we worry if it looks too good!!! Jessica and I are so greatful for both of you, your guidance and such a comfortable process. Anyone we could possibly send your way we would do so with the utmost confidence. Thank you both again! If either of you ever need a testimonial or if a client is on the fence, I would be willing to personally speak to them; we are THAT thrilled about the process and final product! When you mention James Allen costs more, to be fair to James Allen; they provide a lot of customer services, including lifetime care for your ring, and have a lifetime upgrade policy. I don't work for them or anything like that...just a customer : ) but they have been very good to me over the years. Wonder why all the reviews of this dealer start with someone extremely happy customer WHO HAS NEVER POSTED ANYTHING ELSE HERE BEFORE? I think they are fake reviews. I called this dealer because he showed the lowest price on a diamond listed by several other websites. 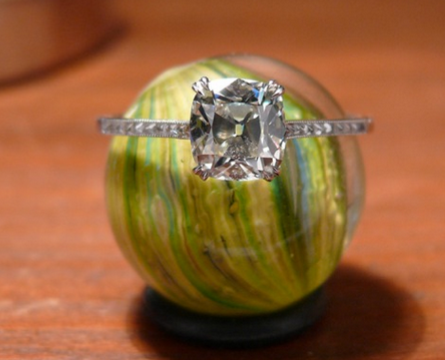 I called and it was 'out of the country' and he said he would get me a list of similar stones. Never heard a peep from him again. I called him once more and he said he would send it but never did. The 'reviews' all look similar to me. Hi Allisonfaye. It's Martin Sheffield from USA Certed Diamonds. I can assure you that these reviews are not fake, and are from genuine customers. I apologize for not sending you out a list but will be more than pleased to. If you can please just email me the details of the request to mailto:[email protected] or call me at 800 252 1476 I will get the list out to you immediately. Again, I apologize for not sending it out but will attend to it right away. Thank you and looking forward to hearing from you. In this world of instant gratification people have failed to develop the virtue of patience. I'm certainly guilty of it. Martin also took more than a few days to get back to me regarding an inquiry. Throughout that time I politely asked for updates and finally got a response. Most of the time when we inquire about a specific stone, we are at the mercy of the wholesaler. They are the ones that will provide a magnified image, Idealscope, or whatever the request may be. After a little bit of emailing, I picked up the phone and actually spoke to Martin. There was no problem getting the stone that I asked about. I could have had it inside a week (it was also out of country). But Martin told me that he could arrange for me to visit a few sites that would have the diamond on hand so that I could view them. Within two days I booked my ticket. Five days later I was in NYC in the bowels of the Diamond District with an itinerary of stones to view that were at my price point, met my parameters, were in the US, and vetted by acquaintances of Martin. All the stones I looked at came with a personal opinion based on Martin and his people's expertise. Picked the one, wired the money, and now the ring is being made also by Gemkraft in NYC at a significant discount, I might add. Easy peasy lemon squeeze-y! Martin, several of us have given up on trying to contact you. My issue wasn't how long it took him to get back to me. Although outside of here, he didn't. I found it fishy that every one who talked about him only had 1 or 2 posts.